Adding live food to your koi fish's regular dietary intake provides variety and additional nutrition. Though it can be a bit more costly than pellet feed, live food is more natural and provides enrichment for domestic koi. Mealworms are suitable live food for koi, packed with essential nutrients and easy to obtain. Mealworms are easy to raise, even, so you can have a fresh supply available at all times. The negative aspects of mealworms as a feeder food is that their exoskeletons are somewhat harder to digest and that koi may not be interested in eating them. After some time, they may learn how to eat them and will enjoy this live food. 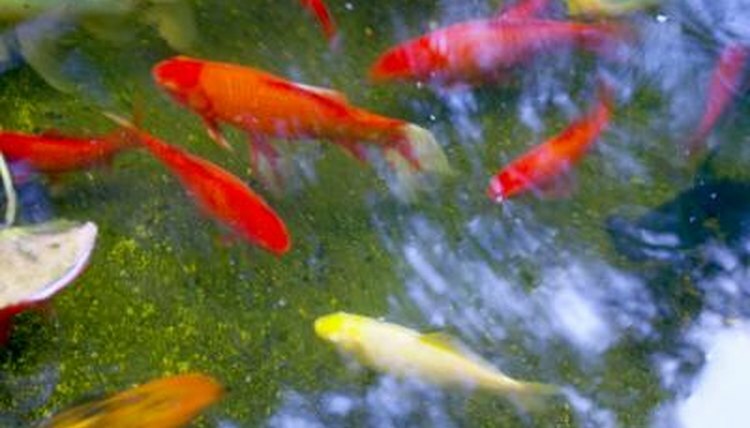 Most pet supply stores have crickets readily available, making them a tempting option for feeding koi. Crickets are easy to keep and are available in a wide array of sizes. However, crickets can be expensive, and you must feed a great deal of them to provide any level of nutrition. Earthworms are easy for koi to digest and can serve a side role helping recycle organic waste. Worms are highly nutritious and healthy for fish. There are no considerable downsides to feeding live earthworms year-round. While mealworms, crickets, and earthworms are some of the easiest live foods to feed your koi, your fish will also enjoy small crustaceans, insect larvae and a variety of other worms. Live shrimp, bloodworms, silkworm pupae and even tadpoles can be a healthy part of the captive koi's diet.